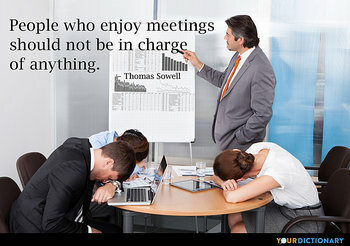 Most business meetings are staged to supply people who'd rather talk than work with people who'd rather listen than work.  1990 'Grab Bag', in the San Francisco Chronicle,7 Apr.  L. E. Dickson, during a discussion period that followed the presentation of a paper at a meeting of the American Mathematical Society, where he criticized the choice of the paper’s topic. Fifteen minutes later he presented a paper of his own outlining a proof that every sufficiently large integer can be written as a sum of, not 1140 tenth powers (the best previous result), but 1046 tenth powers.  John Faulkner, in his contribution, Red giants: then and now, to The Scientific Legacy of Fred Hoyle, 2005. In life there are meetings which seemLike a fate.  Owen Meredith (Lord Lytton), Lucile (1860), Part II, Canto III, Stanza 8. In life there are meetings which seem Like a fate.